A while ago I mentioned I was excited about our local Good Food Box. And I've been keeping score--a tally of what we're getting in our box for our $15 each month, as well as the cost of the same produce that week if I were to have bought it at my favourite grocery store. My savings? About $15-$17. SERIOUSLY. WHEN DID VEGETABLES GET SO EXPENSIVE?! Gah! All for $15. This is the large box. The smaller box sells for $10. Other months we've received items such as squash, spinach, kiwi, celery, blueberries, cabbage, parsnips, oranges, beets, green onion... generally you always get a bag of potatoes, carrots, onions, and apples--it's generally local or at least more easily attainable food in Canada. All of it is fresh, delicious, and saves a chunk of our grocery bill. Truthfully, I'm unsure how far this initiative stretches. 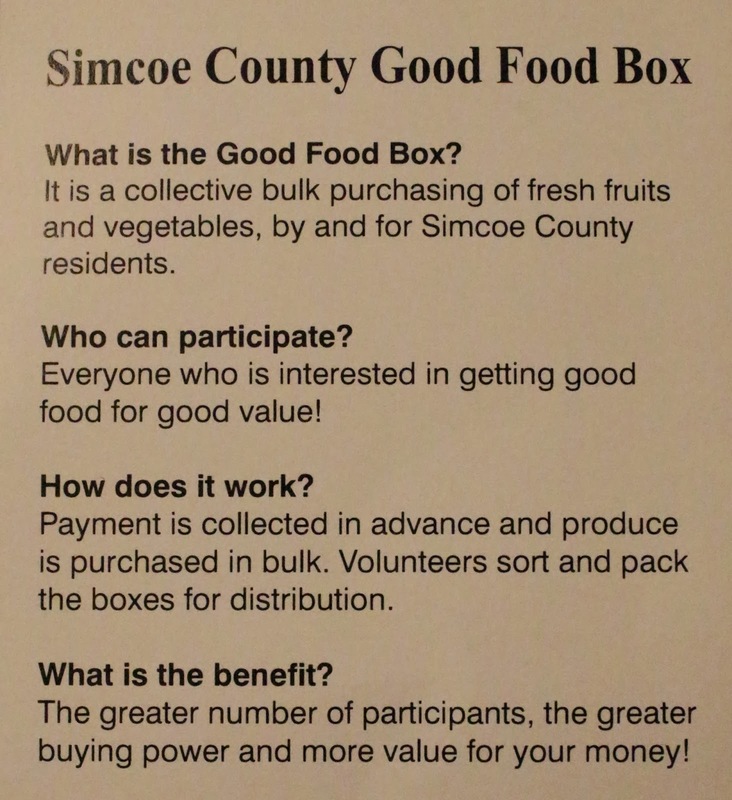 There are plenty of Good Food Box programs across Ontario, but I don't know if it's Canada-wide, or provincially run on a hit or miss basis (Google tells me Manitoba has the program set up, but I'm too lazy I didn't check across the country). I first heard of it when I was living in Toronto years ago, and I know Toronto still has their Good Food Box foodshare program set up (Toronto peeps: you are LUCKY! There's a fabulous variety of boxes available to you: organic, pre-cut, fruit-only... plenty of selection for everyone from busy families to seniors. Definitely worth checking out). If you're in my ballpark of the province more information can be found here (though it seems out of date: the prices have increased slightly from what's listed). For anyone out of the Simcoe County area a quick Google search will show you what's available to you. Mm. Food. What can I say? It's exciting. Thanks for the reminder! I need to remember to order this time.